Beautiful pale sage, light yellow greens, dark sage make up this lovely combination. This yarn makes for a delightful pair of booties using our free pattern! 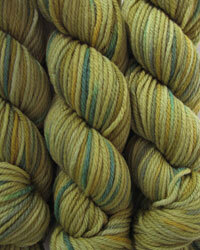 This yarn has been discontinued and is no longer being - limited to stock on hand. Gauge: 4-1/2 sts = 1"
Silky Tie Wrap Pattern Free!